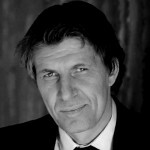 Per Elvestuen is the Public Relations Vice President and member on the board of directors at CCDD. He is an advisory and communications expert in Norway. Elvestuen has extensive experience as editorial cartoonist, journalist and in strategic advisory services. He has a background in media, consulting, analysis, leadership, policy work, and human rights. He won the Editorial Cartoon of the Year award in 2003 and has published some books of his illustrations.